Once again, Happy New Year to all and wishing everyone all the best for 2104. We started back, officially on Monday 6th January 2014 to a very cold dairy. It was about 8 oC at our place which is usually, when not making cheese, about 4 degrees warmer than the outside temp. But at least it has not not snowed, not at work, anyway, and it has, in reality been quiet mild. I did half days over the period except New Year’s Day so had already sorted out the post, the bankings, paid the wretched tax bill on 2nd Jan and rustled up a few customer orders. On Monday, we made a small vat of Tasty Yorkshire, portioned up a load of goat curd for a Tuesday customer collection, prepared the first order to go out in 2014, put the smoker on and tried to keep warm! 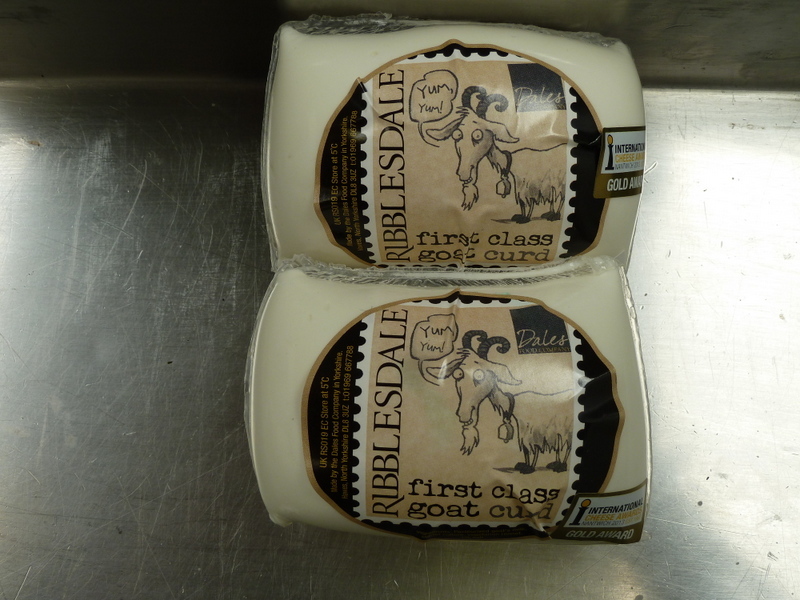 We received our first delivery of goat milk yesterday, on Tuesday and in all honesty, we were expecting to be shorted (I am not complaining!) as there is usually very little available in the early part of the year, due to kidding etc and again, more often than not, snow. So, no snow is a good thing as hopefully the goats are happier and warmer and producing milk early. And talking about the lack of snow…when is it safe to take off snow tyres that have been on since November? Update Thursday 9th Jan 2014: not yet! It snowed at home last night and ‘the tops’ as we call them were very snowy when driving in to work this morning – total absence of grit – no surprise there. Tuesday was a mad waxing day and we waxed several tables of Superior Goat Gouda including green halves which neither Stu nor I enjoy doing, Original Goat, all of the smoked cheese and some Wensleydale. Stu has bought an internet radio so can now listen to sounds of any decade of music he likes, though I notice it was on the 80s today! 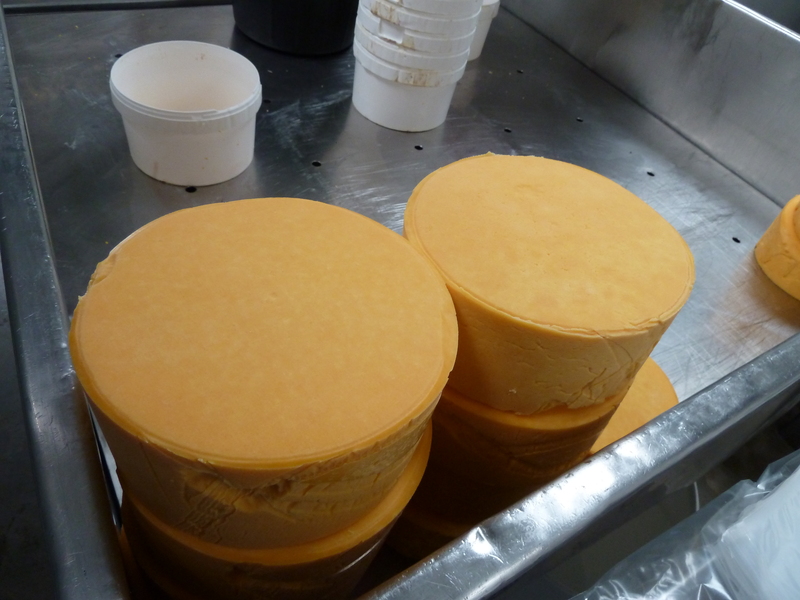 Today is Wednesday and Stu and Andrew are making a 1,900 litre vat of Superior Goat Gouda. I have been working out what starter culture we need to order for the next few months and liaising with the supplier and am on almighty e-mail catch up, feeling thoroughly ashamed of not answering e-mails for quite some time. I am also thinking about some NPD when I can get some appropriate starter. manage to beat it despite telling you this is definitively THE best deal, ‘you won’t get better’. I think we have now achieved the most sensible price with a company called SSE. I am going for a two year contract, because a) I do not want to go through this again any time soon and b) it looks to me like energy prices are going to continue to escalate and we should take advantage of a two year deal which, oddly, in the end, turned out cheaper than the best one year deal. Strange that. I have been speaking to the soon to be new owners of Yellison Farm, Ed and Sharron who are hoping to move the goats to their spot by the end of February and take over cheese making and goat milking from that point onwards: I wish them all the very best of luck. Tomorrow, Thursday, Stu and Andrew are making a 1,656 litre vat of Original Goat, I am going to continue my e-mail catch up but have to nip out for a couple of hours and on Friday, we will be vac packing today’s gouda make, sorting out today’s goat curd make and bagging that up plus it is the day of Steve’s funeral: Skipton Crematorium, January 10 at 12.20pm, followed by a wake at Skipton Rugby Club. I noticed on Monday that someone from Mongolia viewed the blog 12 times – if you are that person, please e-mail me and tell me who you are, what interests you and why you are reading our cheese blog!